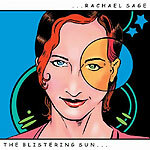 CD review: "The Blistering Sun"
Transcending standard music formats with a broad musical vision that stretches from singer-songwriter to folk-rock to power pop to out-there experimental jazz, Rachael Sage manages this feat of straddling numerous styles with an overarching vision that lets her make any song, any style uniquely her own. A powerful yet suprisingly expressive singer, Sage brings a bit of rock toughness to even her most gentle lyrics: Imagine Chrissie Hynde as a folkie. Then she can turn even that inside out, as she recites a poem atop a jazz rhythm section while a trumpet blows gently in the background on "Hit Song." The thing that really grabs you, though, is that even in her most Yoko Ono-ish moments, Sage remains accessible, melodic and fun.